Happy Monday my friends! I hope you have all recovered from your Superbowl festivities. I honestly didn’t care to watch, I’m still holding out for the Detroit Lions to make it to a Superbowl one day to become a fan. I know it will probably never happen but I need to stand by my team. I spent the weekend relaxing for a change, it was nice to have two days off in a row. Saturday we headed to Napa for the afternoon and Sunday my friend Larry came over for lunch and some light decorating at my house. I have had a few lingering projects so he helped me hang some art and make some updates. I know February is going to be one of those months that flies by so I wanted to make sure my home felt settled and relaxed when I have time to spend in it. If you follow Kuzak’s Closet on social media you may have noticed that we spent a ton of time organizing garages in January. We had a handful of custom cabinet installs and several maintenance sessions with current clients. I think January is a popular month to tackle garages because it is a resolution for most clients to tackle. The garage often ends up as a dumping ground and an area that most of my clients are frustrated with. Since we don’t have basements in California, storage is tight and people seeking organizing services with Kuzak’s Closet are dreaming of a functional, clean, organized garage that can serve as a multipurpose space. Many clients are dreaming of storage, a possible parking space for their car, a workout room, or a play room for the kids. Today I am giving you some inspiration to let you know that it is possible to have a garage that will achieve all of those goals. We recently finished working on this gorgeous space in Menlo Park with a client who wanted a space that felt functional and organized. She and her husband have two children and a very active lifestyle. They recently completed a remodel and by the time it came to designing the garage they were burnt out on decisions and decided to wait a little bit before they came up with a plan. I’m glad they did because that meant they were able to find out about Kuzak’s Closet and we were able to connect them with Valet Custom Cabinets, the company that we often partner with for beautiful spaces like this. For projects like this we often work side by side to purge the contents of the space so we can have an accurate list of the items that need to be stored along with priorities when we meet with Karin, our Valet designer. Once we come up with a plan we schedule a day to come and pull everything out to prep for the cabinet install. 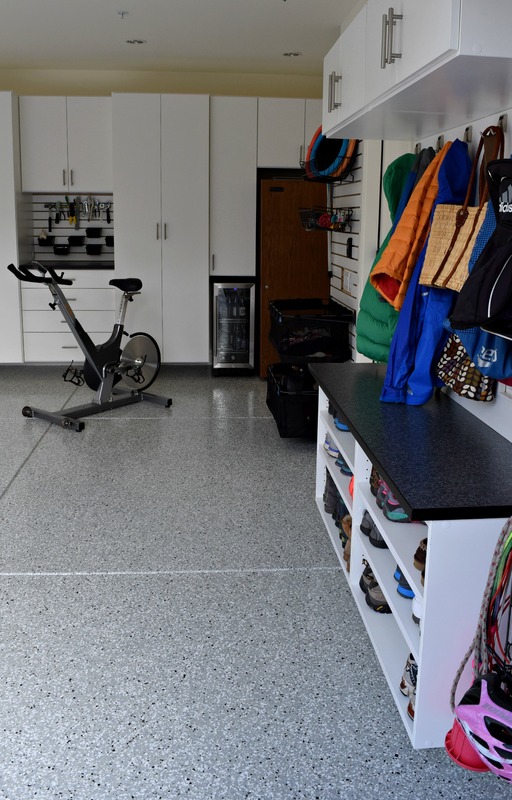 Because this project included a shiny and durable epoxy floor (LOVE), we needed to rent a POD to store the items in while the floor dried, this is often 4-7 days. As we pulled the items out of the garage to organize them into POD for storage, we sorted things into categories and had the client purge unwanted clutter. Yovan helped me with the purging session for this project and we were able to empty the entire garage into the POD in less than 2 hours, pretty speedy! That was the case because the client was motivated and ready to make decisions, she was a champ. We typically check in during the project installation and then come back the day after the project is complete to organize and fine tune the space. Taylor and I teamed up for the organizational piece of this project and had the entire space put back together in 4 hours and Taylor then went back on her own to help install and organize the slat accessories. I am in love with all of the baskets and hooks in this garage. It looks and feels so wonderful to have everything up and off the ground, slat walls such a great organizational tool! My client did a great job planning which slat accessories she needed based on the categories in the garage (mostly sporting goods for the kids). She had a laundry sorter on wheels prior to this custom garage project that helped her curb the clutter before the kids brought it into the house. To replace that we added 2 baskets that clip into the slat wall. It’s the perfect holding space for all of the junk that piles up in the car with kids, you know… DVDs, blankets, sporting goods, etc.. She makes the time to address the items in the baskets each week so things don’t pile up, it’s a great system that works for her. More beautiful slat wall! I love this stuff, it is so customizable and can change as your needs change. If you have a slat wall in your garage and are looking for new accessories check out this site. The cabinets are filled with cleaning supplies, camping gear, household overflow, etc.. We created the cabinets to fit around the wine fridge and small beverage fridge. It’s California after all, we need our beverages! Here is a closer look at the small tool bench on the back wall. It is the perfect amount of storage to house the average household tools. The slat accessories allow things to be organized and visual at the same time, major plus. The drawers below have larger tools, lightbulbs, batteries, etc. I hope you enjoyed this quick tour of the projects we have organized so far this year. There are many more in progress so I hope to add after photos and organizational inspiration soon, until then check out Kuzak’s Closet on Pinterest to get your fix! I’ll be back tomorrow with an estate sale preview for this week’s Palo Alto estate sale so stay tuned!